Within the ranks of the gourmands, are cognoscenti that focus at least in part upon the appreciation of fine movements. It is perhaps this group that is most prone to the growing in-house fanaticism as the idea of “in-house manufacture” has become a kind of safe assurance of quality, value, and exclusivity. 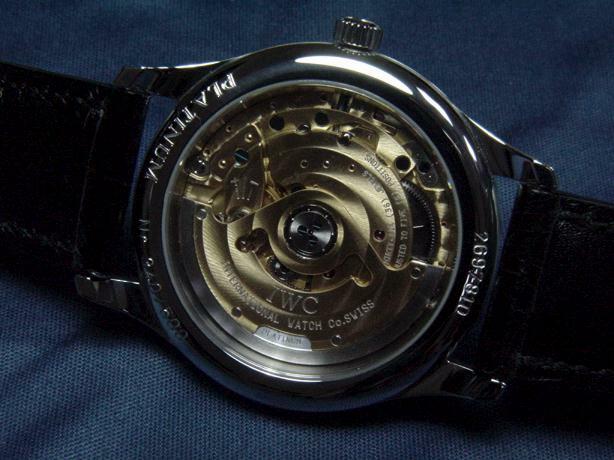 This obsession is reaching a point where only in-house manufacture is accounted to be “real” watchmaking. A brand is not taken serisously unless it is a part of the in-house elite. In this market Minerva‘s Pythagore, a relatively ordinary watch in its own day, has become a kind of cult object because of its in-house calibre 48. Many old brands are buying into this mania for in-house movements — Audemars Piguet by its recent purchase of Renaud et Papi, Chopard with its Parmigiani-designed LUC series of movements, and Vacheron Constantin with rumours of two new movements in development. The interesting thing about this state of affairs is the contradiction inherent in its values. While “tradition” is often stated as an important and motivating value to those who collect mechanically automated watches, the new gourmand ethic precludes a traditional method of production based upon the use of third-party ebauches; a unique and fundamental part of the Swiss tradition of watchmaking. 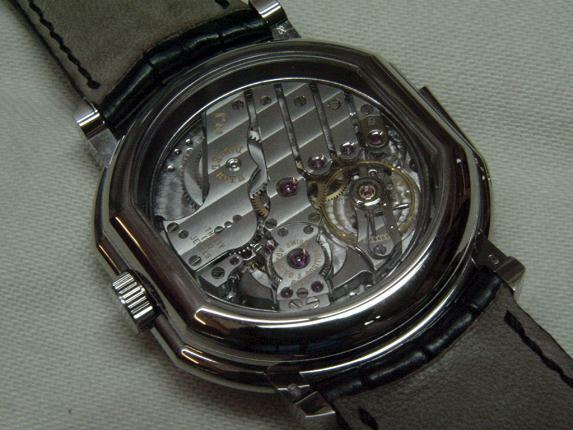 Before the quartz revolution, the Swiss ebauche “system” (so to speak) provided a wide diversity of specialist movement manufactures that in turn supported brands from the economy to the luxury levels, including everything from “tool watch” builders like Breitling, to the “Great Three” of old. Even notoriously self-sufficient independent manufacture Rolex, has depended upon third-party ebauches from time to time. While in-house manufacture was more common then, it did not have the cache it is given today, and it was typically implemented in a different way — wherein ebauche design and production, and watchmaking, were treated as separate endeavours. This separation can be seen historically in the relationship between brands like Omega and Eterna, and their former movement production facilities (Lemania and ETA respectively), which were run as subsidiary companies rather than as inhouse divisions. This same relationship can still be seen between Blancpain and Frederic Piguet. The oft idealized self-sufficiency and integrated manufacturing facilities of Jaeger-LeCoultre is something of an anomaly in the Swiss tradition, yet for our modern collectors it is the standard of the way things ought to be done. ETA, and the nature of these ebauches (and finished movements). Designed for low cost, ease of mass production, and durability, these movements represent the level of mechanical watchmaking that has since been displaced by quartz technology (the outcast nature of which is too deep a subject to survey here). The question posed to the connoisseur is whether these movements constitute craftsmanship within the ebauche tradition. 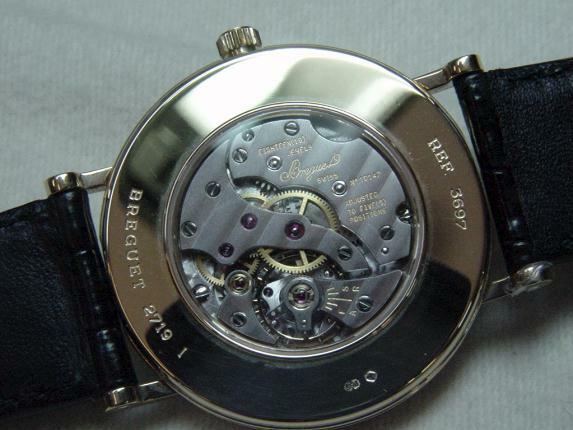 A problem with some of the elite brands which use third-party ebauches is that their pricing does not reflect the economies present in the use of ebauches, and their watches are often more expensive than those subject to the the in-house premium — Vacheron Constantin is probably most criticized for this. The wide disparity of prices in high-grade ebauche-based watches, can be seen clearly between the last two users of Jaeger-LeCoultre calibre 920: Vacheron Constantin’s “Geneva Seal” watch with calibre 1120/1 is priced at $16,000 whereas the Audermars Piguet “Classique” 2120 is priced at $10,000 with a superior Gyromax-based escapement (both watches in gold without date guichet, prices circa 1999). There are others who offend in a similar fashion, and it is this perception of poor value which has also turned away the cognoscenti. Of course the question remains, “What is the value of ebauches?” It is not enough to say that they are not inherently evil, and that they are a part of “tradition.” In terms of technology, the specialist ebauche manufacture typically has greater resources directed to movement development and refinement, often a greater level of expertise across a broad range of movements than the small in-house manufacture, and in some cases unique refinements unavailable elsewhere (like Jaeger-LeCoultre’s switching rocker design and ETA’s Omega-Daniels escapement). Reduced costs achieved through manufacturing efficiencies and greater production volumes usually lead to lower prices at retail (though we have seen that this is not always the case). A broader diversity of watch brands is available, and small independent brands like Ulysse Nardin are permitted to focus their limited development budgets upon novel complications while making use of ebauches like the Lemania 8815 (shown above) as base movements. Finally I would like to note that the fanatical purism of many in-house devotees overlooks the simple fact that most of the fine movements produced in Switzerland are only available as ebauches (and finished movements) from the movement manufactures. In addition to this I would like to suggest that part of the craft and unique art in the Swiss watchmaking tradition is the modification and finishing of an ebauche. Patek Philippe is perhaps the best example of the quality possible with this method of production — seen clearly in its calibre 177 and the CH-27 series movements. Let us start with the Patek Philippe calibre 315, an excellently crafted but technically and aesthetically unremarkable automatic movement. In turn let us consider the premium automatics of two specialist makers: Lemania’s 8815 and Frederic Piguet’s 1150. I submit that either of these ebauches with their dual mainspring-barrel designs, if fitted and finished by Patek Philippe to their standard (Gyromax balance, solid-gold rotor, Geneva hallmark) would result in a finer watch at a lower price than one equipped with the in-house 315. A radical notion to be sure. aforementioned 315/330 SC series. The larger production volume of the 888 movement through sales to IWC (seen as calibre 887 above), Audemars Piguet, Vacheron Constantin, and through Jaeger-LeCoultre’s inhouse label bring price levels down to much more accessible levels (Patek Philippe Calatrava 3998, $11,500; Audemars Piguet Millenary 14908, $8,800). This inhouse premium can be quite severe for low production movements, and considering the merits of the 315 relative to its technical superiors and equivalents, what does it offer at this premium? Exclusivity. Certainly it lies within Patek Philippe’s capabilities to meet or exceed the standards set by the best ebauches of Jaeger-LeCoultre et al., but it is my opinion that in this case they are not doing so. This leads me to propose to fine movement connoisseurs that the value of in-house movements lies not in their exclusivity, but rather in the ability of the in-house manufacture to create and offer something that the ebauche specialists don’t or can’t, or that are superior in some way to the best ebauches available, and that it is these goals which justify the steep in-house premium. 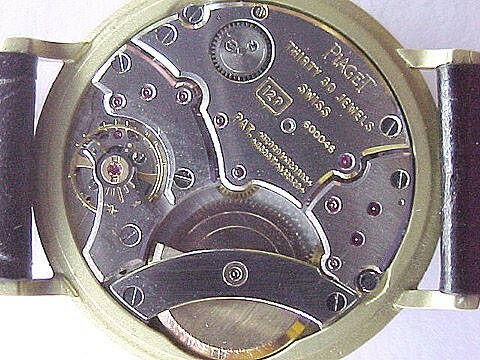 For instance, micro-rotor automatics like the Piaget calibre 12P (shown above) are unique to in-house manufacture. Any brand wishing to offer these at this time must do it themselves. Simple savonette handwinds are not exclusive to in-house manufacture, but one finds that in the very limited selection available that most of the best of these movements are from in-house producers like Patek Philippe, Audemars Piguet, and German manufacture A. Lange & Sohne. There is also a new kind of in-house production based on the licensing of proven designs from ebauche producers. Roger Dubuis is perhaps the best example of this, as they manufacture a number of modified Lemania calibres in-house. Audemars Piguet recently bought the tooling for the exquisite calibre 2120 from Jaeger-LeCoultre, and may now be supplying the ebauche to Vacheron Constantin. The advantages of this type of in-house production lies in greater certaintly in the quality control process, and in adequate supply of movements — a concern brought about by the increasing demand for luxury timepieces. judgments on the basis of “manufacture” status. No doubt it lies with each enthusiast to determine for themselves what it is that they value in mechanical watches, but to those who seek the tradition of fine craftsmanship I wish to suggest that it does not lie exclusively nor absolutely in in-house movements. I think that it is entirely possible for in-house movements to exhibit little in the way of craft, or for even an excellent in-house movement to be exceeded in technical value and beauty by that which is produced by a specialist ebauche manufacture. 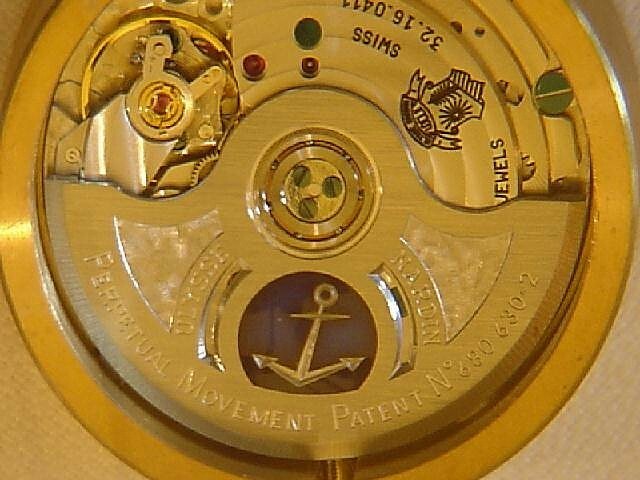 To the connoisseur of fine movements I propose that each movement should be judged on its own merits with no carte blanche of approval automatically granted to any brand or manufacture no matter how fine its heritage or reputation — or how steep its price.